In response to demand for one of our most popular webinars to date, ‘The Business of Social: If Your Janitor is Not Tweeting You’re Doing it Wrong’ is now available to view and share any time you like. 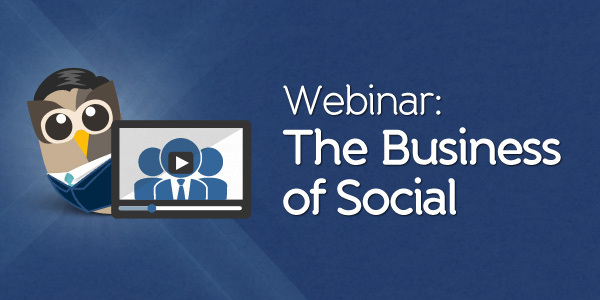 Hosted by our VP of Partnerships and Corporate Development, Matt Switzer, this webinar helps you learn how to scale social, to meet the needs of any enterprise business. Building a solid social media management strategy is essential to your organization’s success. During the webinar, some great questions were asked, and we have addressed them below. Hello, my name is Matt Switzer and I’m the VP of Partnerships and Corporate Development here at HootSuite. This webinar is geared towards those organizations already embarking on social, but who recognize the need to scale beyond singular departmental silos, and want to explore different models to do so. We want to thank everyone who attended, and share some of the answers to the thought provoking questions you asked. If you’re interested in continuing the conversation, please comment below, or join ongoing discussion on our Google+ page. Q: How do you persuade anti-social media or people who are unsure of the platforms/don’t have time to learn to start to collaborate? A: Sometimes it can be difficult to persuade skeptics of the benefits of social media in business. A healthy dose of skepticism is never a bad thing, but social can no longer be dismissed as a fad or a curiosity that should remain on the periphery of an enterprise. Ask your anti-social media colleagues, what happened to all the businesses that remained anti-email through the 90’s? The answer is that they don’t exist anymore because they failed to adapt to reality and competitors left them behind. Today, leading companies of all sizes are reforming their organizations and updating business practices to take advantage of social media. If your people are too busy to start collaborating, they’re never going to achieve all the time-saving benefits of collaboration. They’ll continue to waste more time while competitors reap productivity gains that come from having a more agile, connected and creative workforce. If your colleagues want hard data on social business, you could check out these reports from McKinsey Global Institute and IBM. But first, take a look at this great HootSuite video that has helped countless people “get” social media within minutes. Q: When you say “the right technology”, what do you mean? Q: How does size of a business matter with regards to employee engagement? Think mom+pop vs. Coke. A: With thousands of employees, multinational corporations obviously have greater social media reach than your local corner store. In big companies, employee advocacy on social networks is able to support big-budget marketing activities in traditional and digital media, boosting the effectiveness of these large investments. Employees can align their messages with paid advertising, guide their friends to corporate websites, and amplify the impact of organic press coverage and other “earned” media. But mom and pop businesses have huge opportunities in employee advocacy. If a small business supplements its official social profile with just one engaged employee, it can literally double its social reach. The smaller a company’s social media reach is to begin with, the greater the relative impact of each new employee advocate. Q: Do you find that organizations adopt a hybrid of the two [models presented] between containment and empowerment? A: The containment and empowerment models are great ways to conceptualize an organization’s approach to social, but each organization has to form policies that fit its own needs and goals. From what we’ve seen, the majority of organizations fit very clearly into one model or the other. Q: What are some best practices for empowering employees as advocates if your organization is non-profit? A: The employees of non-profit organizations may already be enthusiastic brand advocates. However, while they might believe strongly in the non-profit’s work, they might not all be trained in how to communicate their organization’s purpose in just a few words to achieve maximum impact. Whatever your non-profit does, make sure that all of your employees know how to tell that story clearly and consistently so they can help people connect to the mission. With all organizations, we recommend you start with a social strategy, and support it with straightforward guidelines or policies to help people engage in ways that are beneficial to your brand. Q: Why do employees make such great brand advocates? Watching the webinar, and want to have your say? Join the conversation on Google+.